Tucking into a lobster dinner at a Maine seafood festival. During the summer and early fall there are a plethora of seafood festivals along the coast of Maine which celebrate fishermen and the fruits of Maine, especially the Maine lobster season. Some events, like the Maine Lobster Festival, are big commercial affairs which attract visitors from around the world. Other events, like Friendship Day and the Frenchboro Lobster Festival, are small town celebrations focused on the local community. Below are eight of these Maine seafood festivals which offer great food, picturesque settings and a glimpse at life along the coast of Maine. 1. The Yarmouth Clam Festival – Yarmouth, Maine: This festival is a foodie’s paradise, with thousands of clams, lobster rolls, Lime Rickeys, shore dinners, homemade pies and strawberry shortcakes consumed across the three day event. There is a pancake breakfast, parade and a variety of other events and competitions from a running race and bike race to a clam shucking contest, diaper derby, fireman’s muster, street dancing and fireworks. Check out the dates and details of the 2018 Yarmouth Clam Festival Schedule here. 2. Fishermen’s Day in Stonington – This annual family fun day on the Stonington Fish Pier features crafts, a slippery cod contest, whacky boat races and lots of local seafood. Check out the date and details of the 2018 Stonington Fishermen’s Day here. 3. Annual Friendship Day in Friendship, Maine – The beautiful lobster fishing village of Friendship hosts an annual summer festival which features a blueberry pancake breakfast, road race, a parade, children’s events, an auction and more. The Friendship Fire Department sell their famous Friendship Lobster Rolls and homemade pies and other treats are on sale throughout the day. Check out the latest Annual Friendship Day Schedule here. 4. The Maine Lobster Festival in Rockland, Maine – This is the biggest and most famous Maine lobster fest. It stretches over five days and serves over 20,000 pounds of lobsters to seafood fanatics each year. All of these lobsters are freshly caught by local lobstermen off Owls Head, Spruce Head, Cushing and Stonington and transformed into shore dinners and lobster rolls for hungry diners. There are a plethora of events over the long weekend, from crate races and a lobster cooking contest to the coronation of Maine’s annual Sea Goddess. Check out the dates and details of the 2018 Maine Lobster Fest schedule here. 5. The Winter Harbor Lobster Festival – This Downeast Maine lobster festival is much quainter than the Maine lobster fest. It includes a blueberry pancake breakfast, running race, lobster boat races, a parade and a fabulous lobster dinner, featuring steamed, new shell lobster, corn on the cob, coleslaw, a drink and dessert. Other yummy foods, including lobster rolls, are usually sold throughout the day. Check out the date and details of the 2018 Winter Harbor Lobster Festival schedule here. 6. The Frenchboro Lobster Dinner – For more than 50 years, the Frenchboro Congregational Church has hosted an annual Lobster Dinner to benefit the Church and the island community. 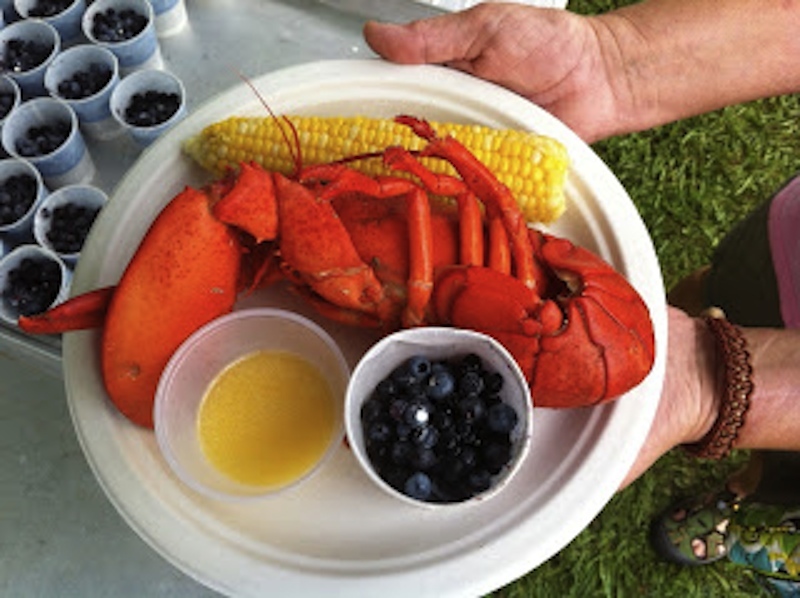 The Frenchboro Lobster Dinner is always held the second weekend in August (rain or shine) and it attracts hundreds of visitors to the beautiful island, many who come year after year to enjoy delicious new shell lobster, homemade pie, live music, a road race and children’s games. Even the journey to the Frenchboro lobster festival is special, as you have to take a ferry boat from Bass Harbor, on Mount Desert Island. Check out the latest Frenchboro Lobster Festival schedule here. 7. Boothbay Harbor Fest – This early fall festival is a 10 day celebration of local food, music and more. Visitors are able to indulge in a plethora of seafood tastings at local restaurants and enjoy craft beers as well as partake in dinner dances, running races and an oyster shucking contest and demo. Check out the dates and details of the 2018 Boothbay Harbor Fest schedule here. 8. Harvest on the Harbor in Portland – Harvest on the Harbor, which takes place on the Portland waterfront over five days, is one of Maine’s most popular and premium Food and Wine Festivals. It features top Maine chefs, food from Maine’s eight regions paired with local beers and wines, a lobster cooking competition and a moonlit gala. Check out the dates and details of the 2018 Harvest on the Harbor schedule here. I live in Texas and would love to experience attending a Lobster Festival in the area. I want to drive there during early fall when the weather is cooler. Is there a festival that is scheduled in September or October? I was under the impression that there was an annual lobster festival in September. Thank you for reaching out. Most of the lobster festivals happen in August, given that late summer is the peak of the lobster season (also known as new shell or shedder season). The Boothbay Harbor Fest happens in September and Harvest on the Harbor take place in September and October respectively. They are not lobster festivals per se but do focus on local seafood and beer/wine. Best of luck planning your trip!